Posted by Toy Lady in Big Lug, Garden, meal plan monday, random stuff, Shopping With Peeps. Yes, I’m pretty much anti-dressing your dog up, but still. I asked Peeps if he had a ratty old T-shirt that I could cut up and use to tie up my baby tomato plants, and he brought me an unworn shirt with the Kraft Cheesasaurus Rex on it. 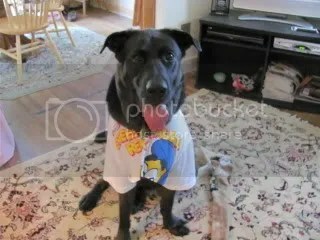 So when I’d used what I needed, I couldn’t resist trying the shirt on Jar – after all, if he’s not a Cheesasaurus Rex, I’d like to know who is! When you can re-purpose leftovers into something completely different – like breakfast! One evening last week, Peeps cooked this fish with mustard-nut crust – and another evening, we tried slow-cooker mashed potatoes. There was a sizable amount of both leftover, so we shredded the fish (nuts and all), tossed in an egg and the rest of the mashed potatoes, and formed it into little patties. Peeps fried those while I was weeding the garden BEFORE it got hot, and they were just fantastic with a poached egg perched on top! It’s time for Shopping With Peeps! Our local supermarket has been doing some rearranging and remodelling lately, and, for the most part, I think they’re finally done. It’s no fun when your regular groceries MOVE from week to week! 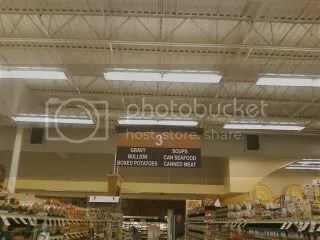 However, I hope their sign company gives them a refund – besides the unfortunate “typo” on every one of the lights at the checkouts (15 items OF less), I finally couldn’t stand it anymore and snapped this photo. I know it’s tricky, but it’s BOUILLON. And, um, can seafood. . . what? I’d even give them credit if it said “box potatoes” – then at least you could assume they meant it as a question. Why no, it can’t wear the gloves, but it can tuna fish! Ahahahahahaha! The sad thing is they got the “can” thing wrong for everything else, but they got it right for CANNED meat. On the same sign. Have I mentioned that Jar’s tummy troubles have pretty much resolved themselves? Thank goodness! After a few days of rice and boiled beef, we switched him over to oatmeal and poached chicken. 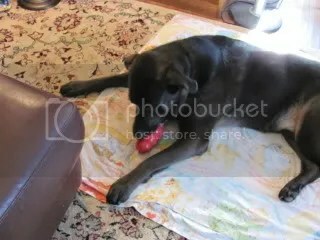 We gradually worked his kibble back into his diet, until Friday he was ready for his Friday Kong. He was SO happy to have that back – he missed out on it last week! Speaking of Friday Kong night – Oh. My. Gosh. I think I may have found my new favorite pizza – at least until tomato season, anyway! We had a little bit of leftover roasted asparagus (fresh and local – the best way to have asparagus!) and a couple of slices of deli ham. 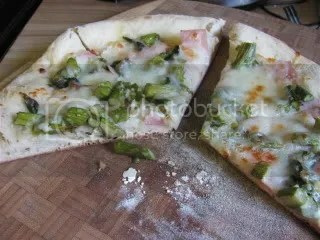 I chopped both up and sprinkled them on my pizza with a bit of olive oil and mozzarella cheese, and WOW! It was definitely more than the sum of its parts! I have found that if I go out to work in the garden first thing in the morning, right after the dog has eaten breakfast, it’s just easier all the way around. The soil is still wet from watering, and it’s not so hot yet (in fact, most of the yard is still in shade). 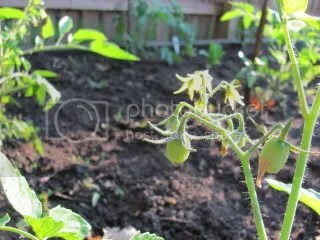 Well, this weekend, while Peeps was cooking breakfast, I went out and weeded, then tied the tomatoes to their stakes. And what, you ask, did I find? I’ve got baby tomatoes! Woo! And once again, it’s time for the weekly menu plan. It’s going to be a warm week – we’re heading into the middle of June, after all, and we’re just a couple of weeks from official summer, though the weatherman on my radio station talks about “meteorological summer” – and I think we’re there. 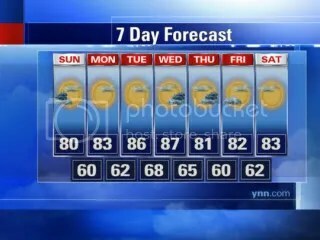 It’s looking to be a fairly warm-ish week, but after Monday, not too bad. well, not too bad if you don’t mind a little rain, anyway. But at least I won’t have to water the garden for a few days! Monday – It’s gonna be brutal. It’s our first “triple H” day this season, I think – hazy, hot and humid. I think we’ll take the pup to the beach, and, when we get back, rather than stand out on the deck grilling in the blazing sun (our deck is on the west side of the house – that’s where the back yard is), we’re going to take this opportunity to get all the bits and pieces and dribs and drabs of leftovers out of the refrigerator. Tuesday – Peeps brought some ravioli home from work the other day – I’ve been wanting to try grilling it. I know, pretty awesome idea, right? But it turns out that I’m not the first person who’s thought of it – go ahead, google it. I’ll wait. Wednesday – A while ago, we made this crunchy & creamy beans & greens and it was really good – we’re going to try it again with cannelini beans and a bunch of escarole. And maybe some bacon because, well, why not? Thursday – Last summer, we found this recipe for grilled chicken with white barbecue sauce – we’ll grill some chicken breasts and make a half a recipe of the sauce, and it’ll be delicious! Friday – Yay for pizza night! I’m hoping there will be some leftover veggies and/or chicken throughout the week that I can decorate my pizza with. Peeps will likely go with his pepperoni and extra cheese pie and The Jar will enjoy his Kong. 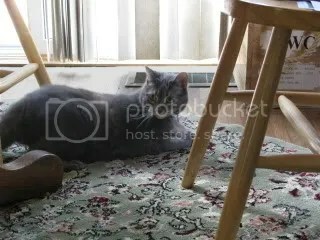 Posted by Toy Lady in Big Lug, Garden, Musings, Shopping With Peeps, Stupor Kitty. I don’t know about you, but I think that once you start getting serious about raking leaves – THAT’s when it’s really, truly fall. 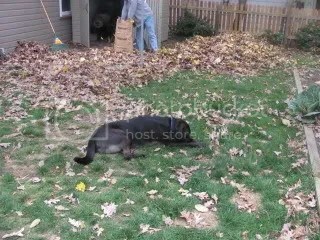 Fortunately, we had a gorgeous weekend to get some yard work done, and we even had “help” from the Big Lug. Even more fortunately, though, we gave him a bone, so he just worried about that rather than the Big Scary Rake! 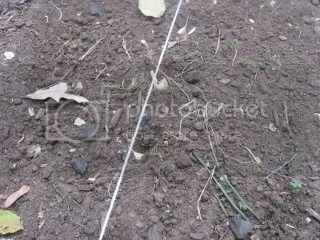 Of course, now that we know just how easy it is, we couldn’t let the snow fly before we got some more garlic planted! It was a simple matter of hoeing a row in the garden, spacing several fresh cloves of good, homegrown garlic about 6 inches apart, and covering them back up. Next summer – woo hoo! More fresh garlic! Over the summer, when I bought fresh corn, once we cut the corn off the ears, I stashed the cobs in the freezer. Go ahead and ask. Why? 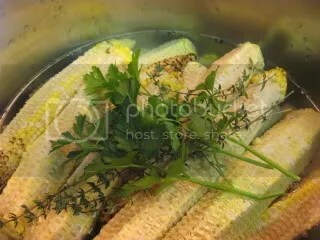 Well, this weekend, we pulled all the cobs out, added some fresh herbage, covered the whole mess with water and simmered for a couple of hours. Corn stock is absolutely amazing – especially in corn chowder! I actually remembered a camera this week, so . . . it’s Shopping With Peeps! We’ve noticed that there seems to be a shortage of canned corned beef. I don’t understand, first, why anyone would actually want to buy canned corned beef (I think it smells kind of like Alpo) and second, why there would be a shortage. However, what I REALLY don’t understand? 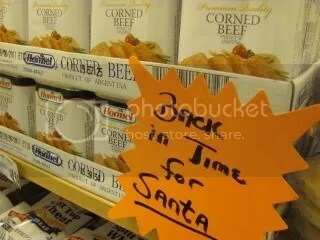 What in the WORLD does canned corned beef have to do with Santa? The secret life of kitties. When The Evil Puppy goes upstairs to go to bed, she doesn’t even wait until he’s all the way up the stairs, and she comes trotting out into the dining room like she owns the place. And sometimes she gets surprised by someone waiting for her with a laser pointer! You know what may be even better than a Kong toy? An empty peanut butter jar is an amazing treat for the puppster – there’s just enough peanut butter left in there to keep it interesting for him, and it’s just small enough that he can’t quite shove his whole face all the way in it, though if he really works at it, his big old tongue does a pretty good job pre-cleaning the jar. 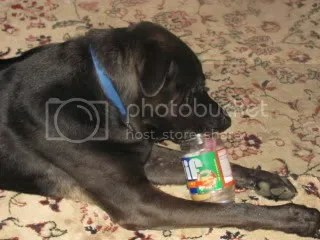 See, choosy moms really do choose Jif. Don’t forget this week is the Third Thursday of the month! Please feel free to join us for this month’s Third Thursday event – just “borrow” a recipe (or any other anything) from someone else’s blog (or elsewhere) and tell us about it! Be creative – challenge yourself! Is this progress or what? You see that? 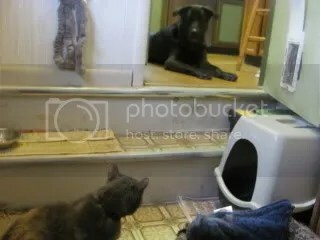 It’s the dog, in a down-stay in the kitchen, and the cat, just standing there looking at him in disbelief! And the two of them are no more than 4 feet apart – with nothing between them but my down-stay. Who is the best puppy of all? And once again, it’s time for the weekly menu plan. Fall is definitely here, but the weather is just teasing us a bit – mid-November, and we’ve still got 50- and 60-degree days! 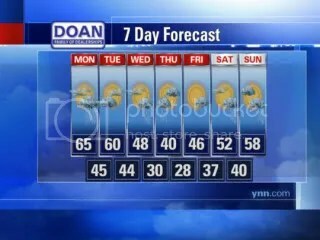 However, I’ve been in upstate New York long enough to know that, while Sunday’s forecast may promise one thing, good weather in November is a fickle friend. Monday – A while back, I did a little experimenting (uh oh!) – I took some of Peeps’s breakfast sausage, added a bit of celery, onions and carrot, and, basically slow-cooked it just like I would bolognese – only it’s breakfast-y. 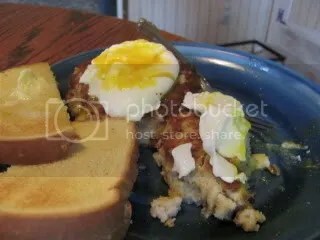 Besides putting together a breakfast lasagna (great quick breakfasts for the Boy), I also had about a quart leftover. We’re going to try it with some fresh pasta, and maybe a poached egg on top. Wish us luck. . .
Tuesday – We got this new fish on sale a couple of weeks ago – swai – and we were less than thrilled with it. We did not much care for the texture – at least not pan-fried. Since we bought TWO packages of it, we’re going to try to finish it up, this time in Creamy Baked Fish Fillets, along with baked potatoes and maybe some roasted squash. Wednesday – Peeps has been dying – DYING – to make this recipe for Meaty Baked Beans we saw in Cook’s Country a while back – well, all the planets finally lined up, and we’ll be enjoying it, along with some of my garden’s collard greens and probably mashed potatoes. Thursday – It’s been a while since we’ve had the Ethiopian Red Lentil Stew that we so enjoyed a while ago – plus we’ve got extra corn stock in the fridge that needs to get used anyway. Friday – Again, it’s pizza night. The Jar will get his normal Kong toy, and we’ll have our normal pizza (light on the cheese and a little ricotta filling for me, lots of cheese and pepperoni for Peeps, and something in between for The Boy). Posted by Toy Lady in Garden, Musings, random stuff. I picked my first tomato this week – and we all know what that means, right? It’s officially summer – for real! Surprisingly, the first tomato wasn’t even one of the “early” heirlooms – it was one of the Big Beefs – my one hybrid this year. 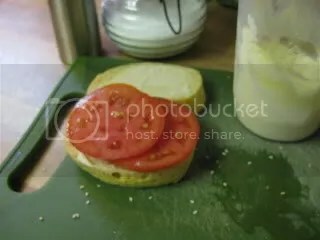 So, as per tradition, the first tomato of the season became the first tomato sandwich! Peeps brought home a lovely loaf of semolina bread, and I still had some of my homemade mayonnaise in the fridge. . .plus, I had plenty of tomato left for another sandwich for breakfast the next morning! There’s no rule against a tomato sandwich for breakfast, is there? Truly, summer just doesn’t get much better, does it? 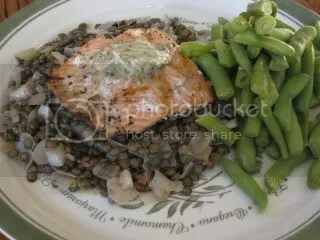 So last week, we made this grilled salmon with French green lentils – and it was quite nice. (And I don’t even like salmon!) We served it with green beans, picked fresh from the garden, which is always a good thing. 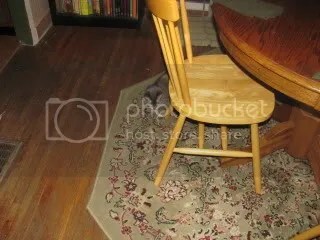 While the dog was napping on the landing in the other room, the kitty decided to get a little brave! We’d picked up a catnip toy for her a couple of weeks ago – it’s what I call a mousy-bird – a mouse-shaped toy (that we stuff with catnip) with feathers sticking out of it. It makes her nuts! Boy, pretty soon, they might even be able to look at each other, then go about their business, huh? 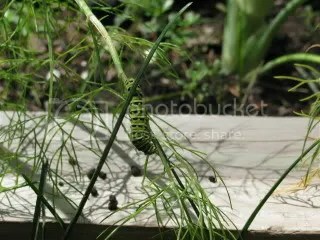 I noticed these little worm-things in the garden the other day – they’re only on the fennel, and I don’t think I’ve ever seen anything like these black-and-green striped caterpillars before so I asked the internet. It appears that they’re caterpillars from the black swallowtail butterfly. Huh. Butterflies hatching in my garden. Just . . . huh. So, you know how I picked a tomato this week? Yeah, I picked another one. And if the first tomato of the season is earmarked for sandwiches, the second has to go for pizza. 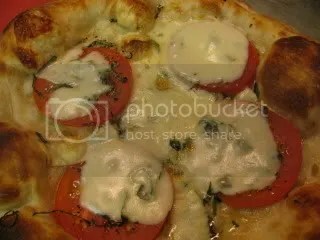 I’m just saying – pizza margharita – fresh tomato slices, fresh mozzarella, and some fresh basil, along with some good olive oil – it’s a very good thing. So. 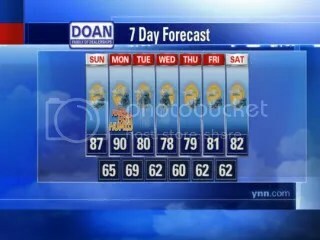 I turned on the TV the other day, and the local-guy cooking segment was on R-News YNN. He was making a blueberry-cantaloupe smoothie. EXACTLY the same way I’ve been making smoothies for YEARS! If Dan Eaton has been either reading this blog or peeking in my kitchen window, the least he can do is flounce in and say “hi,” don’t you think? 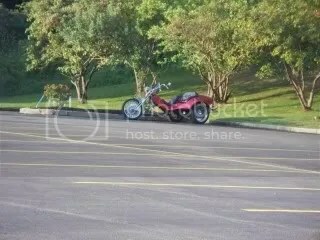 I glanced out the window at my office the other day, and saw that someone in my building has been riding a, um, three-wheeler? tricycle? to work. I’m not sure what the proper nomenclature is for a motorcycle with an extra tire, but it’s pretty neat – and it’s got THREE WHEELS! It’s not quite “Shopping with Peeps,” but we were walking the dog, and occasionally, he likes to stop by Abbotts – I think he’s hoping they’ll be open so he can get a cone. While they’re not likely to be open at 5 in the morning anyway, we were amused by the sign from the night before – when we had a decent amount of rain. Not just closed due to weather – Oh no! 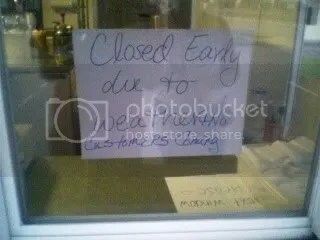 – but there were no customers anyway! And once again, it’s time for the weekly menu plan. It’s looking like another gorgeous, summer week, isn’t it? Maybe a little rain later in the week, but at least the temperatures are looking to be a little more reasonable – we can’t take much more of this 90-degree, 98-percent humidity stuff! Blech! Monday – We’re still trying to make a point of cooking at least one recipe from each cooking magazine to which we subscribe, and this week, we’re going with Cuisine at Home‘s falafel burgers – basically, seasoned chick pea burgers on pocket pitas, cooked on the grill. It’s worth a try, anyway, right? Tuesday – We dug a pork loin roast out of the freezer – yes, we’re still trying to get that emptied – I don’t think there’s an actual bottom! Peeps is going to come up with something exciting to do with the roast – something on the grill. We’ve also got some beets from the garden to use, along with either some salad or green beans, or a starch of some sort. Wednesday – I roasted a chicken over the weekend (and it was GOOD! ), and, with some of the leftovers, I’m going to be playing around with some sort of chicken-tarragon-ricotta filling for crepes, all coated with a cheesy cream sauce. It’ll be good – really! Thursday – Freezer cleaning – we found a package of beef tenderloin tips from a while ago – they were vacuum sealed, so they’re perfectly fine, just been there a while. I’m thinking something simple, like a stroganoff or the like. That’s always a winner! Friday – And it’s pizza night! 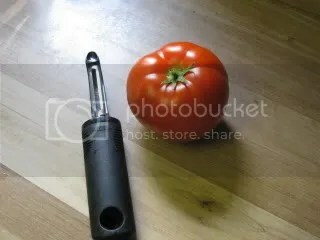 Let’s hope I can score another tomato or two, huh? Wow, that’s just the best pizza ever!